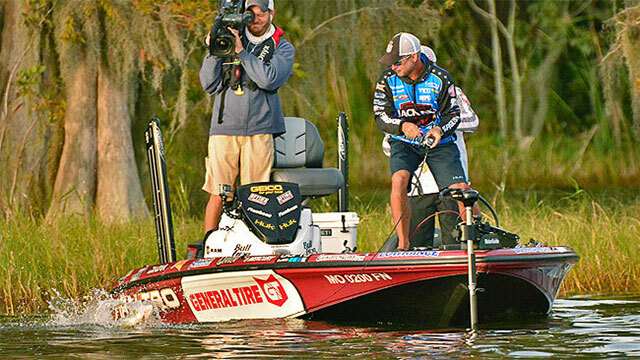 Before the Jack Link’s Major League Fishing 2016 Shell Rotella Challenge Cup began on the Harris Chain in Lady Lake, Florida, angler Jeff Kriet sat in a tenuous spot. He was near the bottom of the cup-angler points standings, putting him in jeopardy of being cut from MLF Cup competition going into the 2017 season. Kriet had not advanced out of an Elimination Round since the 2013 Summit Cup at Chautauqua Lake. Essentially, for Kriet, it was now or never on the Harris Chain. During his Elimination Round, the pressure to gain ground in the points pushed Kriet aboveboard and, well, overboard. Kriet turned in a brilliant fishing performance during his Elimination Round in which he went in head first for a fish that had lodged his line in a dock piling. After a short diving expedition, Kriet emerged with the fish, which put him over the top to win his Elimination Round day. Now Kriet has another challenge before him: be one of the first three anglers to catch 18 pounds in Sudden Death. Kriet may have dried out from his overboard fish wrangling, but he was still soaking in the victory of his Elimination Round with hopes of using the momentum to win Sudden Death. Read the rest of “Kriet Angling to Avoid Jeopardy in Sudden Death” at MajorLeagueFishing.com.